Some of my favorite and most memorable vacations as a child and adult were road trips. Travelling cross country from California to Florida when I was twelve is a trip I will never forget. Up before dawn to beat the heat my sister and I continued our sleep in the back seat (we did not have the luxury of an air conditioned car). After a few hours on the road we would stop for a big breakfast and later for an early roadside diner supper. My dad was not one for making a lot of stops seeking out road side amusements, like the world’s second largest ball of twine ala National Lampoon’s Vacation. Ah but at the end of the day, around 4 o’clock there was always a swimming pool and a good nights’ sleep. In a recent Road & Travel Magazine Blog about family vacations they write; ‘Your family vacation could be as simple as taking a road trip to an unexpected region in your own state.’ They couldn’t have said it better! Feeling nostalgic I recently googled ‘road trip’ and found a fun website, Road Trip America . The site has a list of suggested routes and itineraries. I randomly chose one in Wyoming, one reason being that it is one state I have not visited and would love to one day. I thought it would be fun to take this virtual trip a step further and search out bed and breakfasts along the way and create my own itinerary. Perched on a hill above Cheyenne is The Howdy Pardner B&B. 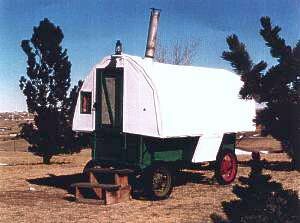 You can stay in one of their three rooms or in their authentic Sheepherder’s Wagon. That looks like fun but you have to trek to the main house to use the privy. This would be a great room for kids with strong bladders. 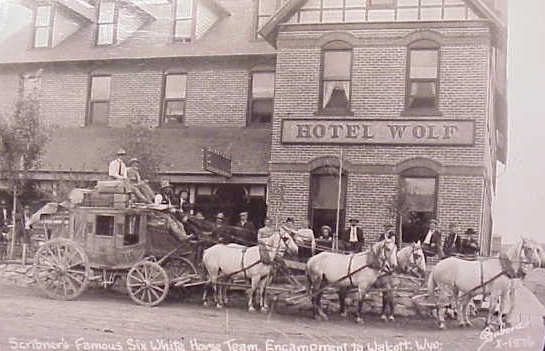 Trip Advisor reviews boast of the hosts’ old west charm and hospitality and immaculate housekeeping, no road dust here. A cowbell alerts guests that their ranch style breakfast is about to commence and I’ll bet its’ good and there’s’ plenty of it. A fun way to stay. Next stop is Laramie and the Mad Carpenter Inn, a downtown location just a short walk from the University of Wyoming. An immaculately restored “shabby old house” as stated by the carpenter/innkeeper who after so many years of restoration calls himself mad! Besides the detailed custom ceiling to floor woodwork, a great part of this inn is the game room with pool table, foosball, ping pong and antique piano. A family way to stay. Down the road off of our main route of I 80 on Route 130 you will pass through the central Wyoming section of the Routt National Forest. It is a steep winding drive through beautiful scenery which is closed in the winter. After a nice scenic drive in good weather we travel back to I 80 and check into the Elk Mountain Hotel. This is a small historic hotel and restaurant with the look and feel of a luxury B&B. Set in the country, the hotel was once on the Overland Stage Route with western history oozing from every corner. An historic Wyoming way to stay. We take surface roads to our next destination, Saratoga. From the name you may assume the area has some hot springs, and you are right. The ‘very’ hot mineral springs, Hobo Hot Pool, is right in the heart of the small town and offers a free plunge and is open 24/7. For a more luxurious experience there is the Saratoga Resort & Spa. They feature intimate private teepees next to their hot spring pool which you can enjoy along with a spa treatment. Not free of course but available to travelers not staying at the resort. 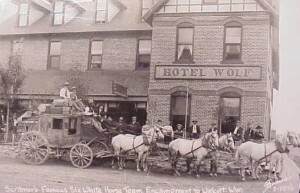 I chose another spot for lodging because I like the name, The Wolf Hotel! I would describe this establishment circa 1893 as a down home fun and funky way to stay! A restaurant and bar with rooms to let upstairs. You would almost expect to see Matt Dillon and Chester mosey through the door. The last leg of our trip, Little America, population 56, appears to be known only for the 80 acre, 188 room Little America Hotel and Resort, with café and ‘beautiful new fuel center’ plus a nine-hole executive golf course. Definitely not a bed and breakfast but worth a roadside attraction look see (or fuel stop) even if you don’t stay there. Set in the middle of a vast Wyoming prairie, local legend tells that the founder was stranded on a cold Wyoming blizzard night with no shelter and over time this spot morphed into one of the ‘must stop’ places on I 80. Our virtual trip ends here. It was fun and educational and I hope one day to make it a reality. No matter where one travels in the 50 states and abroad there are interesting and unique bed and breakfasts and small hotels to make any road a road worth travelling and your trip a journey of discovery. You may have picked up on my references to PAII’s new marketing campaign, A Better Way to Stay. I believe this journey illustrates how unique, interesting and diverse all of your properties are, so many wonderful ways to stay. Whether it’s two for the road or with the family in tow we at The B&B Team would love to hear about your favorite road trip. Also we would love to hear how you have helped your guests’ create treasured road trip memories? Have any of you created your own road trip itineraries with other B&Bs? This entry was posted on Friday, December 3rd, 2010 at 10:05 pm	and is filed under Innkeeping Business, Market Trends, Marketing. You can follow any responses to this entry through the RSS 2.0 feed. Both comments and pings are currently closed.